According to Ministry of Business, Innovation and Employment, the share of electricity generated from renewable energy sources, like geothermal, hydro, wind, and biogas technology, was 79.9% in 2014. This is the largest share of renewable energy sources in electricity generation since 1996. In 2013, this share was 75.1%. The share of renewable energy sources in power generation has been increasing since 2009. Renewable energy sources contributed about 80% to the total electricity generated in New Zealand in 2014, latest figures released by the government show. Electricity generation from renewable sources increased by 7.17% in 2014 over the generation seen in 2013. Power generation from geothermal, hydro, and wind energy projects increased in 2014 while generation from wood and biogas projects declined marginally. Geothermal power registered the biggest increase in generation amongst all technologies — fossil fuel-based or renewable energy. With 6,847 GWh generated from geothermal power projects in 2014, it overtook natural gas-based power generation for the first time in 40 years. PANGALENGAN, Indonesia—In this serene corner of Java, farmworkers pick tea leaves from striped-green hills threaded with pipes. The three-foot-wide pipes carry steam from a broiling underground reservoir, a reminder of the volcano that once erupted. Here, along the volcano-rich Ring of Fire, the Wayang Windu Geothermal Power Station uses the Earth's heat to produce energy that emits few or no greenhouse gases. It aims to expand, because it's discovered what may be the world's biggest hot steam well. "We have a very big resource," says plant engineer Boyke Bratakusuma, as he points to the increasingly deep exploratory wells that Jakarta-based Star Energy is drilling in the shadow of the Wayang and Windu Mountains. Heat-exchange expert Doug Lockhart has two problems with geothermal heating systems: neighbours can’t see them and no moving parts attract the casual onlooker. “If I go to your house and put in a geo-thermal system, nobody knows,” said Lockhart, owner and president of Lockhart Industries in Duncan. This lack of public recognition has even had Lockhart and colleagues considering whether to give out medallions or special, twirling weather-vanes to advertise a home or building whose owner has opted for a geothermal energy system. The same lack of recognition also means Canadian homes and building owners are missing out on one of the most efficient and effective sources of heat energy in the world, heat-exchange technology. Last week I spent the better part of a day listening to presentations of energy companies at the Wall Street Analyst Forum in New York. Although I had heard the management of US Geothermal (HTM: NYSE) tell the company’s story before, I was impressed to hear about the progress the company has made in squeezing profits from electricity produced with turbines run by underground steam. Management called it gratifying! The company reported $31 million in sales in the year 2014, delivering $14.9 million in net income to the bottom line. That is something to celebrate! Calgary-based Borealis Geopower is aiming to build geothermal power plants at two British Columbia locations that it hopes will be churning out electricity from the heat of the earth by 2018, the company’s chief geologist said in Vancouver this week. Notwithstanding that the province essentially put large-scale geothermal exploration in B.C. on the back burner, along with a lot of other independent power projects, with its decision to build BC Hydro’s $9-billion Site C dam project, Craig Dunn is optimistic about Borealis’s prospects to build small, 10-to-15 megawatt facilities at Canoe Reach near Valemount and Lakelse Lake near Terrace. “The goal is to be able to show geothermal (power) is a viable option for the province of British Columbia,” Dunn said. Cornwall-based Geothermal Engineering has pushed forward with plans to deliver geothermal heat from exhausted oil and gas wells drilled by fracking firm Cuadrilla. Geothermal Engineering confirmed on Friday that it had signed a memorandum of understanding with Cuadrilla to design a system that could deliver both shale gas and renewable heat. The scheme has been financed by £55,000 from the Department of Energy and Climate Change's Energy Entrepreneurs' Fund and follows the success of field trials last year. The project could be a boon to both emerging industries, helping to boost the green credentials of the shale gas industry that has seen protests over concerns that the controversial process of fracking could cause earthquakes and water contamination. The geothermal industry has also struggled to get off the ground in the UK because of high costs and a perceived lack of financial support from government. The GRC has announced a mid-year GRC Workshop to Yellowstone National Park. The workshop will include a tour of the major geologic features of the park, the site of the greatest concentration of geothermal features in the world, and discussions of its volcanic history, geochemistry, and hydrology. Limited amount of spaces available. Workshop Leaders: Duncan Foley, Gene Suemnicht, and Joe Moore. Double-Occupancy Room: $1,500 for GRC Members, $1,700 for Non-GRC Members. Single-Occupancy Room: $2,050 for GRC Members, $2,250 for Non-GRC Members ($550 upgrade fee for those who have already paid for a double-occupancy room). GRC Student Rate (Double-Occupancy Only): $700 (Must provide a copy of your current student ID with a valid date or a copy of your class schedule when registering). The price will include bus transportation and 4 nights DOUBLE-OCCUPANCY accommodation in West Yellowstone. Also included are 4 lunches, one reception, trip materials and one dinner. NOT included are the cost of flights to/from, and accommodation in Salt Lake City on June 21st and 26th, and the cost of breakfasts each day and 3 dinners. For payment options, including a deposit to reserve your place, please contact the GRC office for more details. The 13 MW net capacity U.S. Geothermal Raft River geothermal power plant and the Raft River Enhanced Geothermal System site where stimulation activities are being conducted. 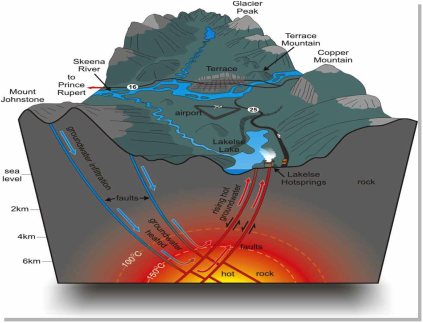 The geological and geothermal features of the Yellowstone super volcanic system. 300 plus geysers – more than half of all the geysers in the world. More than 10,000 thermal features comprised of brilliantly colored hot springs, bubbling mudpots, and steaming fumaroles. For more up to date information and agenda, please visit the GRC Website. For any questions or concerns, please contact Anh Lay by email at alay@geothermal.org or by phone at (530) 758-2360 ext. 100. More of Nevada’s extensive geothermal energy is being tapped after the Governor’s Office of Energy (GOE) granted a tax incentive for construction of a geothermal power plant in Mineral County. Ormat Technologies, Inc. received the incentive for its Don A. Campbell Phase II geothermal power plant after meeting State and local statutes requiring that the project provide employment for Nevadans, a living wage with comprehensive health benefits, and a major capital investment in the State. Once completed, the power plant will be capable of generating up to 19 MW (net) on a yearly average basis, above the Power Purchase Agreement nominal target of 16.2 MW, which will be sold to Southern California Public Power Authority under a 20 year contract. Also see Don A. Campbell Geothermal Power Plant Receives State Tax Incentive from March, 2014. Known worldwide as the author of the theory of Hydroseismicity, and his work in Reflection Seismology and Geothermal Energy. Dr. John Kendall Costain passed away on Tuesday, March 24, 2015. He was born in Boston, Mass., on November 18, 1929, to Ina Mae Weaver Costain and John Thomas Costain. He received his Bachelor's Degree from Boston University, and worked for Mobile in Venezuela for three years. He then went on to receive his PhD from the University of Utah. Dr. Costain had a long and distinguished career as a Professor of Geophysics at Virginia Tech, retiring after 29 years in 1996. He continued his research and continued to write papers until his death. Dr. Costain is known worldwide as the author of the theory of Hydroseismicity, and his work in Reflection Seismology and Geothermal Energy. He has a chair endowed in his name at Virginia Tech. Dr. Costain is an author of 14 papers listed in the GRC Geothermal Library. Geothermal Engineering Ltd (GEL), based in London, has signed an agreement with shale gas firm Cuadrilla Resources to explore the feasibility of producing geothermal renewable heat from used oil and gas wells, the firm said on Friday. The two companies have signed a memorandum of understanding to develop technology to show that geothermal heat can be delivered from deep wells that were originally drilled for other purposes such as oil and gas extraction, Geothermal Engineering said in a statement. The project will initially focus on the technical design of the system before considering a potential field trial, using one of Cuadrilla's exploration well sites. At the end of last year, on a leased property two hours southeast of Regina, Saskatchewan, Deep Earth En​ergy Corp. began preparations for Canada’s first geothermal power plant. Unlike other renewable energy sources, such as wind and solar, geothermal energy runs 24/7, and isn’t subject to seasonal variations as with hydroelectric. And according to CanGEA, the Canadian Geothermal Energy Association, Canada has enough geothermal potential to supply at least 5% of its electricity via geothermal. So why is this only Canada’s first plant? Deep Earth Energy thinks it has found a winning combination of relatively low cost, location and, most importantly, a proven power resource. The company is taking advantage of existing oil industry data to skip the high cost of exploration, and is using new drilling technology that the company claims is earthquake-safe. It also helps that the Saskatchewan site is in a populated area where the locals are no strangers to energy development, and access roads already exist. If successful, the company’s planned 5 MW pilot plant will produce enough energy to serve around 5,000 homes. "The boreholes at Eastgate are an important resource for understanding the UK's geothermal potential". Lafarge Tarmac was planning to sell the £1.4m site at Eastgate in Weardale at auction on Thursday. But the company has now confirmed it withdrew the property from public auction after entering private talks. Meanwhile, Durham University hopes new owners will continue to explore the site's geothermal potential. 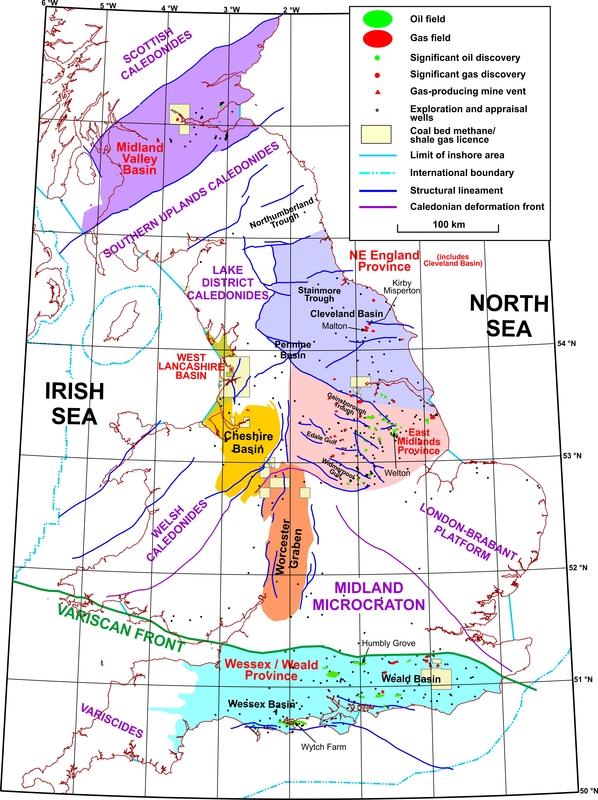 Dr Charlotte Adams, research manager for BritGeothermal at the Department of Earth Sciences at Durham University, said: "The boreholes at Eastgate are an important resource for understanding the UK's geothermal potential. "Geothermal energy can help the UK become more self-sufficient and resilient with respect to energy in the future. "We therefore hope that any subsequent site owner will view the boreholes as an asset and continue to support their use for Research and Development purposes." The Diocese of Bacolod is against any attempt of geothermal producer Energy Development Corp. (EDC) to explore the North Negros Natural Park (NNNP), another protected area in the province. “The destruction left by EDC in its wake could never be restored not for the next 20 or 30, or even 50 years. We cannot allow another man-made threat of destruction to what's left of our protected forests, the negative impact of which will resonate for generations to come and slowly destroy the environment, ravage communities and obliterate lives,” the bishop said. The bishop issued the statement after it was earlier reported that EDC is eyeing to drill for another geothermal power plant in Mt. Mandalagan, which is part of the NNNP. Responses to RFI must be submitted no later than 5:00pm ET on April 24. The U.S. Energy Department's Office of Energy Efficiency and Renewable Energy (EERE) has issued a Request for Information (RFI) to help quantify and manage risk in geothermal exploration, in an effort to reduce the high upfront costs of drilling. 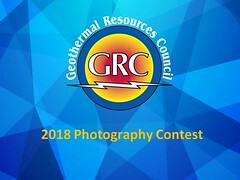 The purpose of this RFI is to solicit feedback from industry, academia, research laboratories, government agencies, and other stakeholders on issues related to cost and risk reduction in late-stage geothermal exploration activities such as drilling and advanced geophysical surveys. Due in part to the lack of response from industry operators and developers during the 2014 Play Fairway Analysis FOA, EERE is specifically interested in information on current opportunities to develop, test, and validate risk and uncertainty models for potential projects that have already been identified by industry. In 2014, the Energy Department's Geothermal Technologies Office (GTO) funded eleven projects focused on reducing risk and uncertainty in early stage geothermal exploration. Selected projects adapted methods borrowed from the oil and gas industry, commonly known as 'Play Fairway Analysis.' This RFI is intended to lay the groundwork for a planned 2015-2016 Funding Opportunity Announcement (FOA) that could increase the success rate for drilling targets in later-stage exploration activities with industry. This is solely a request for information and not a funding opportunity. EERE is not accepting applications at this time. Responding to this RFI will not provide any advantages to future applicants of a potential FOA. Final details of a future FOA – anticipated size and timing of any EERE-funded awards are subject to Congressional appropriations. Feedback to this RFI will be accepted no later than 5:00pm (ET) on 4/24/2015 and must be submitted electronically to playfairway@ee.doe.gov as attachments to an email. Read the full, published RFI and follow the guidelines in EERE Exchange. "This is a clear sign that when a government enables a market with direction and certainty, it results in real investor confidence." The share of renewable energy on the grid in New Zealand is the highest it's been in close to 20 years, the country's energy minister said Thursday. The share of electricity generated from renewable resources last year was 79.9 percent, a 5 percent increase from the previous year. The government attributed the rise to the growth in geothermal generation, which more than doubled in the last decade. In his statement Thursday, Energy and Resources Minister Simon Bridges said geothermal energy contributed more to the New Zealand grid than natural gas last year. "This is a clear sign that when a government enables a market with direction and certainty, it results in real investor confidence," he said. The government aims to have 90 percent of its electricity supplies through renewable resources by 2025. Fuji Electric announced that they have been selected as the supplier of geothermal power equipment for two major projects in Indonesia and Iceland. The power electronics manufacturer will supply two units of geothermal steam turbines and generators—each with a power generation capacity of 20 MW—to PT Pertamina Geothermal Energy, a subsidiary of Indonesia's oil, gas, renewable and new energy company PT Pertamina. The production is to be completed by the end of year 2016. In the Republic of Iceland, Fuji Electric was awarded a contract for a power generating unit for the Theistareykir Geothermal Power Plant, slated to begin in October 2017. Fuji Electric Co., Ltd. will be exhibiting at the GRC Annual Meeting & GEA Geothermal Energy Expo, September 20-23 at the Peppermill Resort Spa Casino, Reno, Nevada, USA. Emerging Power Inc. (EPI) said it confirmed a geothermal resource of up to 40 MW at its concession site in Oriental Mindoro. The drilling activity was done with the help of Quest Exploration Drilling, Inc. (QED). EPI Chairman Antonio G. Zamora said QED worked with geothermal consultants ISOR (Iceland GeoSurvey) and the Magister Geothermal Program of the Institute Teknologi Bandung for the exploratory activity. It involved the digging of two small holes and thermal measurements, returning a reading of 181˚C - even higher than the 170˚C initially estimated. Geothermal energy is delivering clean, base-load and low cost electricity in 25 countries as well as commercial heating in 70 countries... And we think BC should be benefiting too! While not yet fully utilized, geothermal energy is an important part of Canada’s energy future, creating new investment and jobs in Canadian communities while also contributing to a cleaner environment for future generations. Join Chief Geologist of Borealis GeoPower, Craig Dunn, as we explore the Canadian energy industry’s efforts to develop geothermal energy. More guest speakers to be announced. Craig will discuss his company's ground-breaking field work completed this past summer that proved new exploration techniques from other industries to be valuable. Anders Kruus, a financial specialist will also be presenting. More information........ Click here to register! Your organization has the opportunity for high visibility at the Geothermal Resources Council’s 39th Annual Meeting & GEA Expo scheduled for September 20-23, at the Peppermill Resort Spa Casino, Reno, Nevada, USA. Geothermal energy is alone among the renewable energy sources that has “dispatchablity” -- the means to quickly ramp up power delivery during peak hours or scale back when the grid has excess. Gov. 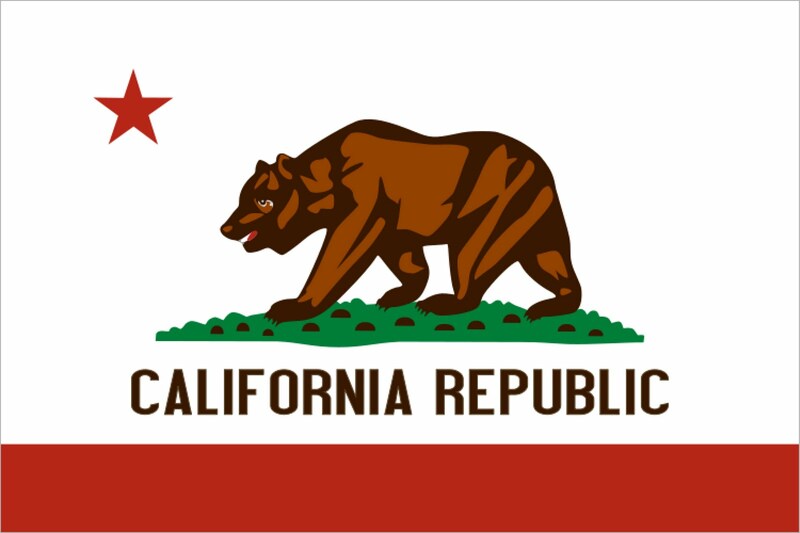 Jerry Brown and his allies in the Legislature want California to generate half of its electricity from renewable sources by 2030, an increase from the target of one-third by 2020. However, making sure all that clean energy can be used when needed is a big challenge, because the state lacks adequate storage capacity. Renewable energy can be difficult to manage because it is intermittent, and no one can control when the sun shines or the wind blows. Sometimes California ends up generating more energy than needed at any given time, and power plants need to be shut down. And it’s tricky to hold onto electricity until it’s needed. NewsChannel 21's Wanda Moore went up to the Newberry geothermal site and talked to officials about when the site will start producing power. Power for a whole town, provided from a 5-acre site. That could soon be a reality at the Newberry geothermal site by Paulina Lake. Officials said Tuesday new federal regulations on fracking -- injecting high-pressure liquid underground to extract oil or gas -- won't apply to their project. Alterra Power Corp. has reported its audited financial and operating results for year ended December 31, 2014. In regards to it's geothermal energy assets, Alterra Power makes the following comments: In South America construction activities have been completed or are underway at the joint venture (JV) Mariposa project located in Chile in preparation for planned large-bore drilling in late 2015. A further JV with Energy Development Corp (EDC) covering the remainder of Alterra's development assets in Peru was completed in 2014. EDC will hold a 70% interest in the projects and fund 100% of the next $6.0 million of project expenses. The company has decided not to pursue any of the Peruvian concessions under a previous joint venture signed in July 2013, effectively ending activity on these properties. In January 2015, the company sold the 15 MW Soda Lake geothermal facility and related geothermal development assets to an affiliate of Cyrq Energy for proceeds of $8.5 million plus potential additional compensation over the next five years upon the achievement of certain earn-out provisions. Alterra retained the rights to develop a 40 MW solar project at the site over the next six to eight years. Ormat Technologies, Inc. announced today that its subsidiary entered into a 20-year Power Purchase Agreement (PPA) with Southern California Public Power Authority (SCPPA) for interstate delivery of electricity from the second phase of Don A. Campbell in Mineral County, Nevada. Under the terms of the PPA with SCPPA, the second phase of the Don A. Campbell project will receive a rate of $81.25 per megawatt hour with no annual escalation. SCPPA will resell the power to Los Angeles Department of Water and Power (LADWP). As with the existing Don A. Campbell geothermal plant, electricity from the new project will be transmitted to the LADWP grid via NV Energy's statewide transmission system, including the One Nevada Transmission Line that connects service areas in both northern and southern Nevada. Ormat recently announced the release of the project for construction, and expects it to generate up to 19 MW (net) on a yearly average basis, above the PPA nominal target of 16.2 MW. Commercial operation is expected in the first quarter of 2016. Northleaf Capital Partners, Ormat's new joint venture investor, will purchase approximately 40% interest in the project which will be added to the existing ORPD joint venture once the project is completed and commissioned. A new study suggests that a previously unknown rocky layer may be lurking about 930 miles beneath our feet -- and evidence suggests that it's significantly stiffer than similar layers, which could help explain earthquakes and volcanic eruptions. The finding also suggests that the Earth's interior is hotter than previously believed at that depth below the planet's surface. Dr. Lowell Miyagi, an assistant professor of geology and geophysics at the University of Utah said in the statement that he had calculated that the average temperature at the boundary of the upper and lower mantle is about 2,800 degrees Fahrenheit -- and a scorching 3,900 degrees F at the deeper, more viscous layer. "If you decrease the ability of the rock in the mantle to mix, it’s also harder for heat to get out of the Earth, which could mean Earth’s interior is hotter than we think," he said. The study was published online in the journal Nature Geoscience on March 23, 2015. A 400 km-wide (250 mile-wide) impact basin from a massive asteroid that broke in two moments before it slammed into our planet has been found in north-eastern South Australia by a team of scientists, led by Dr Andrew Glikson of the Australian National University’s Planetary Science Institute. The twin scars of the impacts – the largest impact zone ever found on Earth – were discovered during drilling as part of geothermal research, in the Warburton Basin – an area near the borders of South Australia, Queensland and the Northern Territory. The geothermal research project chanced on clues to the impacts while drilling more than two kilometres into the earth’s crust. The drill core contained traces of rocks that had been turned to glass by the extreme temperature and pressure caused by a major impact. “The two parts of the asteroid must each have been over 10 km (6.4 mile) across – it would have been curtains for many life species on the planet at the time,” said Dr Glikson, who is the lead author of the paper published in the journal Tectonophysics. The search for geothermal energy under the dormant Hualalai volcano on the Big Island is moving forward. A University of Hawaii researcher has asked the state Board of Land and Natural Resources for a geothermal exploration permit to conduct a noninvasive geophysical study of the west rift zone of Hualalai, just north of Kailua-Kona in the north-west of the Big Island of Hawaii. Peak demand for electricity rarely coincides with the brightest sunshine or the strongest winds, so finding a way to store clean power and deliver it when needed will be critical as California relies more on renewable energy. On a quiet Sunday morning last April, power plants were pumping far more energy into California's electricity grid than residents needed for their refrigerators, microwaves and television sets. So officials made an odd request in a state that prides itself on leadership in renewable energy: They asked wind and solar plants to cut back their output. For 90 minutes, clean energy production was slashed 1,142 megawatts, enough electricity for hundreds of thousands of homes, while dirtier power from less flexible sources stayed on to keep the system stable. It Is Not Too Late to Register for WGC 2015! The World Geothermal Congress in Melbourne is fast approaching from 19-24 April 2015. Less than 4 weeks away! If you have not registered yet, there is still some time to do it! Click here to complete your registration online! Go to the Program page for information on sessions details, presentations and speakers. The Program will cover a range of topics from technical to business, scientific to socioeconomic, electrical to direct use. Raya Group Ltd (ex Panax Geothermal) and PT Bakrie Power Corp are looking for new potential buyers of the 30 MW Sokoria geothermal project in Indonesia following the termination of an existing pact with Sydney construction company Space Con Pty Ltd.
Australia-based Raya said on Monday that the two parties will not sell an 85% stake in PT Sokoria Geothermal Indonesia to SpaceCon, as agreed in January, because certain documents were not presented to the Indonesian authorities by the March 11 deadline. The heads of agreement between the companies has now been cancelled. Raya noted that, alongside Bakrie, it is already holding talks with other interested parties. The Australian geothermal firm has a 45% interest in the Sokoria project, while its partner holds 53%. The first 5 MW unit of the geothermal power facility, located on Flores Island, is expected to come online in December 2018, whereаs the whole plant is to reach commercial operations between 2023 and 2024. Costa Rica got 100 percent of its energy from renewables for 75 days straight this year, the state-run Costa Rican Electricity Institute (ICE) announced this week. The Latin American country hasn’t had to use fossil fuels at all so far in 2015, due to heavy rains that have kept hydroelectric power plants going strong. Wind, solar, biomass, and geothermal energy have also helped power the country this year. This reliance on renewables has prompted the country to lower electricity rates by 12 percent. ICE predicts that rates will continue to drop for Costa Rican customers in the second quarter of the year. The Senate Energy and Natural Resources Committee is running full throttle at comprehensive energy reform and could put “pen to paper in the next week or two” to draft legislative language, according to Robert Dillon, a committee spokesperson for the Republicans. 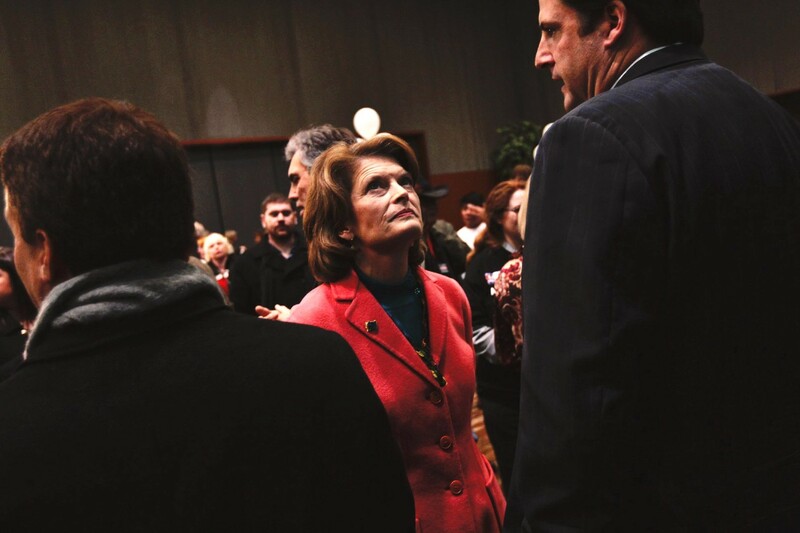 Sen. Maria Cantwell of Washington state, the top Democrat on the panel, said in an interview yesterday that she is working “every day” with Chairman Lisa Murkowski (R-Alaska) to hammer out the details, and hinted a draft measure would be introduced sooner rather than later. “We’re always working on it,” she said. Cantwell was instrumental in passing the Energy and Security Independence Act of 2007, Congress’ last successful attempt at sending a comprehensive energy bill to the White House. But with the shale oil boom, an aging fleet of nuclear reactors, the decline of coal and faster-than-excepted advancements in renewables, the energy landscape is markedly different today, spurring bipartisan support for a new national energy policy. Cantwell and Murkowski are leading that charge in their pursuit to strike a balance between abundant, affordable, clean, diverse and secure energy. Stoke-on-Trent businesses will soon be heated by geothermal energy 11km under the ground after the city was awarded a £19 million grant. Councillors have welcomed the Government funding which will kickstart a geothermal heat scheme, called District Heat Network (DHN). It will provide renewable heat to businesses located in Stoke, Hanley, and Festival Park. It will be the first geothermal scheme in Staffordshire. As well as the £19 million Government grant, £28 million will come from private investors, with the council putting in an additional £3.9 million. The project will involve pumping water into a large hole, which would then travel through an 11km pipe producing hot water at the other side. Stoke-on-Trent City Councillors say the renewable heat will provide businesses with more jobs and save more than 400 people’s homes from fuel poverty. Geothermal power is generally a great source of renewable energy because it’s reliable and can be relatively affordable in areas with good resources. The Big Island of Hawaii already gets up to 38 megawatts of geothermal power from a plant in the district of Puna, the southeast part of the island. Hawaii Electric Light Co. (HELCO), the private utility that serves the Big Island of Hawaii, announced recently that it will be adding 25 megawatts of geothermal power in the Puna region to its power generation mix. I’ll examine the pros and cons of this move in this article. Over 200 guests ar­rived at the Blue La­goon in Ice­land this morn­ing specif­i­cally to see the so­lar eclipse. The blue skies merged with the la­goon's blue wa­ters for a mo­ment that's bound to be mem­o­rable for a life­time for those who wit­nessed it. On March 11, 2015, the U.S. Internal Revenue Service (IRS) issued Notice 2015-25, which provides further guidance to assist renewable energy facility developers and investors in evaluating whether such facilities satisfied the beginning of construction requirement for the renewable energy section 45 production tax credit (PTC) and the section 48 investment tax credit (ITC) in lieu of PTC. The beginning of construction requirement applies to wind, landfill gas, hydropower, geothermal and certain other renewable energy facilities, but not to solar energy facilities. This latest guidance provides some additional certainty for renewable energy project developers and investors regarding tax credit eligibility by extending the continuous construction and continuous efforts safe harbor by one year: if a taxpayer begins construction on a qualified facility prior to January 1, 2015, and places the facility in service before January 1, 2017, the facility will be treated as satisfying the continuous construction/continuous efforts requirements “regardless of the amount of physical work performed or the amount of costs paid or incurred with respect to the facility after December 31, 2014 and before January 1, 2017.” Qualified facilities not placed in service before January 1, 2017, remain subject to a “facts and circumstances” analysis in regard to the continuous construction/continuous efforts requirements. The Latin American country of Costa Rica has achieved the milestone of generating 100 per cent of its energy from renewable resources, with a combination of hydropower and geothermal for 75 days in a row, the the state-owned Costa Rican Electricity Institute (ICE) said. Boosted by good rains at four of he country’s main hydroelectric plants, ICE said that, according to National Electric System figures, it had not been necessary to use hydrocarbons to supply the country’s grid at all in 2015, for the months of January, February and so far in March. For 2015, ICE estimates that 13.09% of the electricity in Costa Rica will come from geothermal plants. Costa Rica is in the process of adding several big new geothermal plants, after a $US958 million proposal was approved by the government in mid-2014. The project, which is being co-funded by the Japanese International Cooperation Agency and the European Investment Bank, is expected to be located in Guanacaste near Rincón de la Vieja. The first plants are expected to generate about 55 MW and cost around $333 million to build. Two other 50 MW plants will be built as well, about 40km from the Pailas II plants. Once operational, it is expected the plants could generate electricity at about five cents per kilowatt-hour. The Philippines Department of Energy (DOE) will soon adopt the One-Stop Facilitation and Monitoring Center (OSFMC) in a bid to facilitate and fast-track renewable energy (RE) projects in the country. This developed after the OSFMC, a program spearheaded by Mindanao Development Authority (Minda) together with the DOE and concerned government agencies involved in the application process of RE projects, was tested in Mindanao to hasten the application for RE projects. Romeo Montenegro, Minda director of investment promotions and public affairs said that generally, RE project applications would have a long process as compared to non-renewable energy projects. He said that generally, RE project applications would have a long process as compared to non-renewable energy projects because of the regulatory approvals by the government agencies is it has to go through. RE projects include eight geothermal projects with a potential capacity of 278.48 MW. The projects are in various stages of applications. Some have already been awarded with service contracts while others have yet to receive one. Maria Richards, coordinator of the SMU Geothermal Laboratory in the Roy M. Huffington Department of Earth Sciences, has been named president-elect of the Geothermal Resources Council. She will become the 26th president of the global energy organization beginning in 2017. Richards has been at the forefront of SMU’s renowned geothermal energy research for more than a decade, and the University’s mapping of North American geothermal resources is considered the baseline for U.S. geothermal energy exploration. SMU’s Conference on Geothermal Energy in Oil and Gas fields, which Richards directs, is pioneering the transition of oil and gas fields to electricity-producing systems by harnessing waste heat and fluids. “This also is a unique occasion for me to encourage and mentor young women to participate in the sciences throughout their careers and get involved in leadership roles,” said Richards, who will be the GRC’s first woman president. President Barack Obama ordered the federal government to reduce greenhouse gas emissions by 40 percent from 2008 levels over the next 10 years by shifting to renewable energy sources. The executive order signed by Obama Thursday builds on a 2010 directive from the White House requiring 35 U.S. agencies to limit their energy consumption to help combat climate change. Private companies that contract with the federal government have also agreed to pursue emissions reductions in concert with the most recent directive. Under Obama’s order, federal agencies will be required to obtain 25 percent of their total energy from renewable sources by 2025. The order targets the 360,000 federal buildings across the U.S., requiring a 2.5 percent annual reduction in energy use for the next decade. The federal government’s fleet of 650,000 vehicles will be required to reduce per-mile carbon emissions by 30 percent. 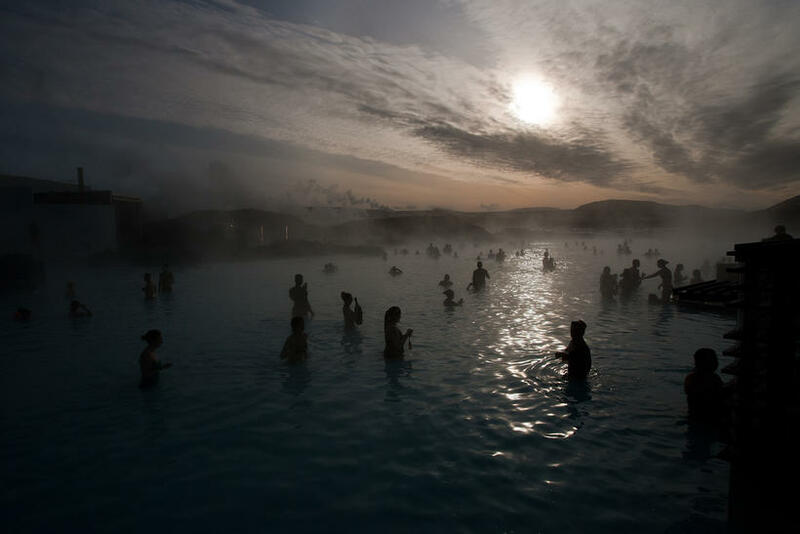 The Blue Lagoon Geothermal Spa is located near Iceland’s Reykjavik city and annually serves more than 40,000 visitors. It also got recognition as one of the National Geographic’s 25 “Wonders of the world”. The article is a gallery of nice photos of the resort. The lagoon is next to the Svartsengi geothermal power plant. Iceland has been relying on geothermal energy to provide for its needs for decades, and today it is a rare case of a society that is more dependent on renewable resources than it is of traditional fossil fuels such as oil and coal. While automobiles and airplanes see a continued demand for petroleum in Iceland, virtually all other sectors of industry and have seen a shift toward renewable energy. While a handful of power plants provide power to the national grid, many renewable energy sites, particularly geothermal ones, operate at the local scale and provide power for farms and households within a certain radius. As an island, Iceland has found that it is burdened with a more crucial need for self-sufficiency, and geothermal power has played a large part in achieving this. As the European nation continues to improve its own energy ecosystem, it has the noble goal of lending both knowledge and helping hands to other nations in their own endeavor for energy independence. Geothermal energy as a whole is one of the many beacons of hope in our world’s future, and with sufficient effort and funding it has the potential to make other regions of the world as commendable and remarkable as the beautiful, volcano-covered country of Iceland. Oregon Senators Ron Wyden and Jeff Merkley today introduced legislation to encourage geothermal energy production on public lands. The Bureau of Land Management (BLM), which manages geothermal projects on federal land under lease agreements, estimates about 250 million acres of federal land contains geothermal power potential. Geothermal energy projects that are producing geothermal power under the BLM’s management make up about half of the total geothermal generating capacity in the United States.